Home Travel Tackle Last Minute Christmas Packing With These Pro Hacks! Christmas is the season of giving when joy is in the air and everything around you is colorful. But it can also be trying especially when you’re traveling. Travel during the Christmas season is hectic because of the soaring ticket prices, unavailability of flights and difficulty in packing. The reason is quite obvious – You are traveling with gifts for your loved ones and that cramps up your luggage space. But fret not, we’re here to help you with last minute Christmas packing hacks that will ensure you have a great flight and a fun Christmas. Play Christmas Carnival and win return tickets for two couples to destinations across South East Asia from Scoot Airlines! The first step in getting things sorted and managing your packing is creating a checklist of all the things that you need and require. Cross off the list of items as you go over. Now, most people think that it actually increases the workload but it’s actually the other way around. The easiest way to do this is by laying all your travel related stuff on the floor and then see for yourself as to how much space it’ll occupy. This basic gauging is very important as it will help you in the next process, below. Just like your cupboards, you end up not using about 1/3rd of your luggage suitcase. So, you can eliminate that 30% by laying it down on the floor and estimating the size of your itinerary. 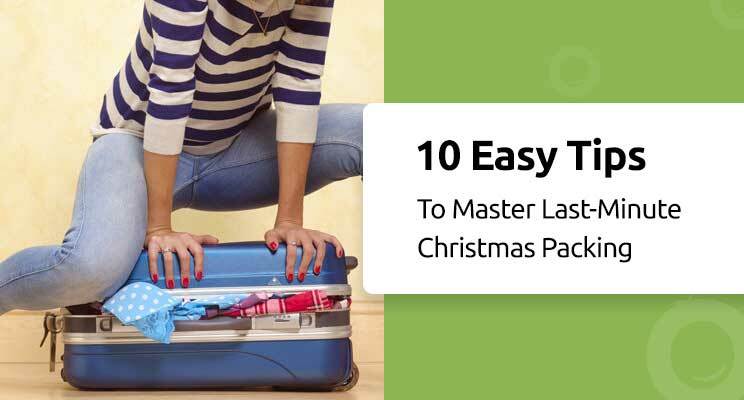 The trick to last-minute Christmas packing is knowing how to save space. I get it that you have a lot of things to be packed but there are a few things that you could do like roll-up your socks or underwear and stuff them inside your shoes to save the space occupied by these items. Footwear takes up a lot of space and becomes a nuisance at times when you need to pack quickly. Always place footwear at the bottom and place them head to toe. Another very useful hack that can save you time and effort is managing the gaps in your luggage. Fill up the gaps by placing soft clothing such as T-shirts and jerseys in between footwear and other tough items. Roll up your shorts and innerwear to create more space and buddle them in the gaps. The best way to store formal clothes and business suits, as well as trousers and skirts, is by interlinking them i.e. placing them on top of each other and then folding them. This will save you space and will prevent wrinkle formation in your clothes. When you’re in a hurry especially when during last minute Christmas packing, you often stuff toiletries and fragile objects like Camera wherever possible and that not only causes, takes up more space but also causes harm to your devices. Instead, spread a plastic cover or a dry cleaning bag and put toiletries, books, and camera on top of it and remember to place it in the middle for maximum protection. Now, place your folded & ironed shirts on top to make space for everything and to avoid creases and wrinkles. 10. Don’t roll up belts! This is one tip that no one might’ve told you up until this moment. Never roll up your belts, that is just a waste of space. Instead, place them around the suitcase or luggage lining at the very end of your packing process. Pack gifts that are small in size when traveling for comfortable flight and to keep in line with the regulations. Were these last minute Christmas packing tips useful?